Andrew McLeod sends the ball downfield. 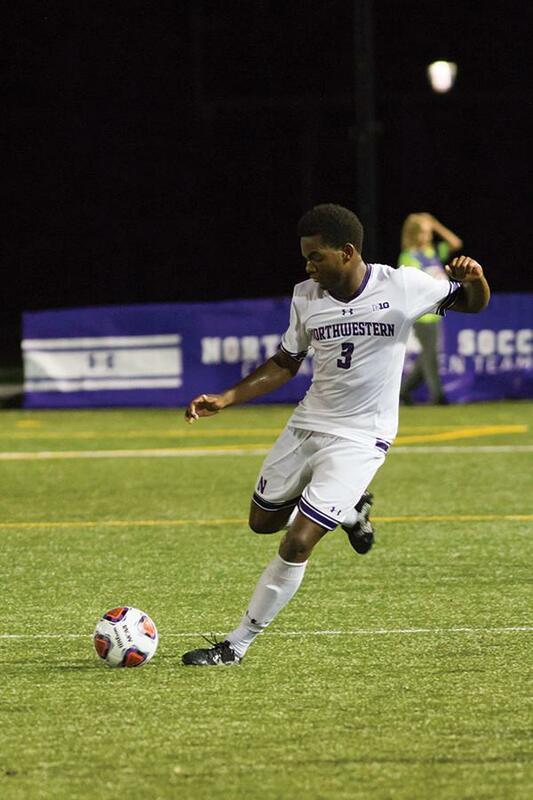 The freshman defender will look to help solidify Northwestern’s back line in a matchup with UIC on Tuesday. Northwestern’s loss to UCF last week hurt the team in more ways than one. The Wildcats (2-8-1, 1-3-1 Big Ten) will battle Illinois-Chicago (4-5-3) on Tuesday night at home. After a tough loss in Orlando, NU hopes to find inspiration, if not victory, and improve its defense before meeting Big Ten rival Rutgers in New Jersey at the end of the week. Against the Knights, the Cats held strong late into the second half after a scoreless 70 minutes. But with time winding down, UCF put together two quality chances, successfully scoring against NU once and forcing junior goalkeeper Francisco Tomasino to commit a foul in the 83rd minute and take a red card in order to avoid a second goal. Currently, the Cats are down two goalkeepers. Tomasino’s red card in the UCF game will result in a ban from Tuesday’s contest, and redshirt freshman keeper Robbie White was ruled out seven to eight weeks after suffering a lower extremity injury during a game against then-No. 3 Indiana last month. As a result, NU will be forced to depend on third-string redshirt freshman goalie Braden Thuraisingham. Tuesday’s game is the Flames’ final non-conference game of the season, and the fellow Chicago-area team is coming off a 2-2 tie against Detroit Mercy. UIC holds a 12-9-1 all-time record against NU, although the Cats topped their hometown rival 2-1 in the teams’ most recent meeting. In the last three games, the Flames have had more than 20 shots, shooting 28 times in the match against Detroit Mercy. NU, who is usually outshot by its opponents, will need to step up its defense in order to hold off UIC on Tuesday. Junior forward Elo Ozumba said playing in Evanston for a crosstown rivalry game means a lot to the team, especially after Wednesday’s loss. Although the team lost Tomasino, putting pressure on the young Thuraisingham to perform well and help get the Cats on track, both Buescher and Ozumba agreed the goalkeeper’s decision was the best for the team. Coach Tim Lenahan said Tomasino made the play he had to and that he expects the team to perform better at Martin Field, the site of its most recent victory on Sept. 25 against Michigan.